Clients don’t enjoy centralized institutional bathing facilities. They prefer to bathe in the privacy of their own bathroom. Institutional bathrooms take away from the ambiance that Assisted Living units strive to provide. Consider the added value that in-unit, high-end spa-like bathing facility can add to your sale and to your client’s quality of life. You can have it all – style, comfort, accessibility and saleability! We can help you design the right mix of centralized bathing facilities and in-room bathing options to maximize saleability and profitability. Some clients delay moving into assisted living because they enjoy having a bathtub, and most assisted living units only offer showers. Remove this buying objection and close more sales, faster. Aquassure tub installed in group home with clearance on three sides for caregiver access. 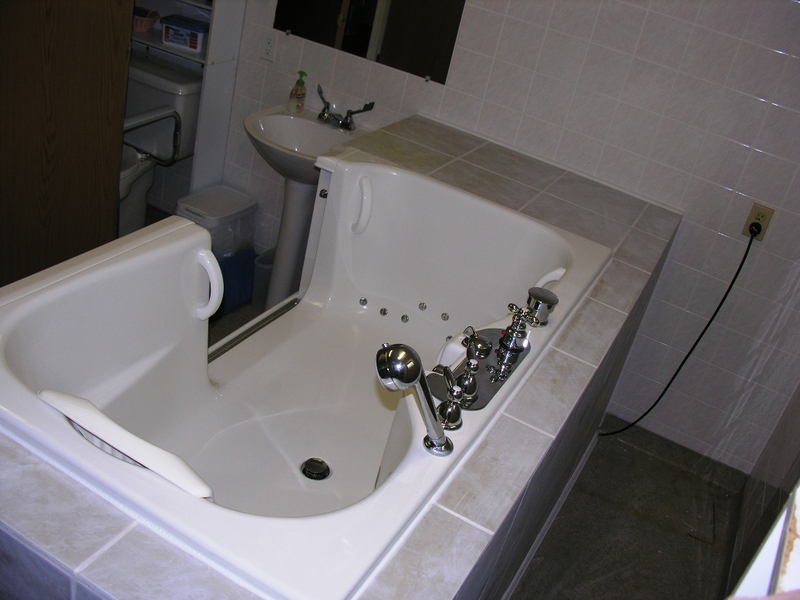 This tub is used independently by some residents and with a caregiver and lift for those with less mobility. Our high-end therapeutic spa bathtubs give a real bathing experience while meeting the needs of people with a wide range of disabilities. Consider a revenue-generating centralized spa bathing room or an in-room upgrade. Fixtures are high-end with thermostatic valves and options of air and / or water jets. The cabinet base can be matched to any décor. The bathtubs accommodate unassisted bathing, or as needs increase, safe, private bathing for both the care-aide and the bather. 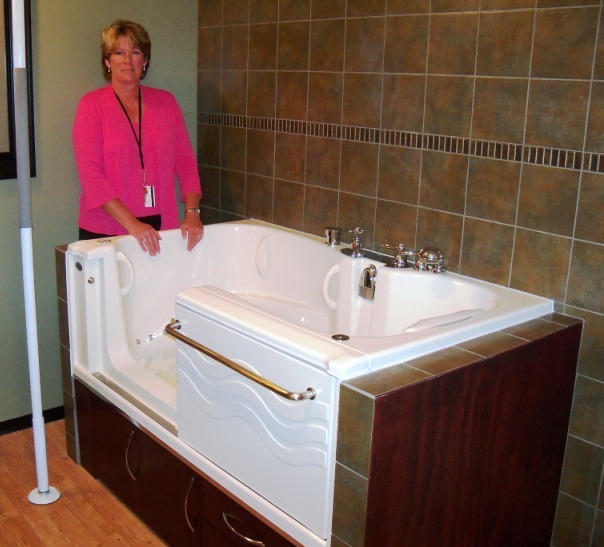 Our bathtubs are accessible from walkers, wheelchairs, and wheeled or ceiling lifts. The bather is at chair height so the care-aide doesn’t have to bend down or lift the patient while providing complete hygiene. Clients are more relaxed, and can benefit from the therapeutic health effects of soaking in a bathtub. Consider the added value that in-unit bathing facilities can add to your sale. Why ruin the look of your bathroom by putting in a space consuming wheelchair shower or a boxy walk in tub? Add value with an Aquassure bathtub! If your facility doesn’t accommodate in-unit bathtubs, then consider the Aquassure bathtub for a centralized spa-bathing area. Your residents can bathe independently, or with the appropriate level of bathing assistance. Facilities often charge for the use of the centralized bathing area – make this a premium service that your residents will line up for! Aquassure Safety Plus left door bathtub installed in care home centralized bathing room. Volume discounts and technical specifications are available. Please contact us to arrange an appointment or to have an information package sent to you. Call 1-866-404-8827 or email us at info@aquassure.com.